Do you “design” a piece or “re-dimension” it? The truth is, I’ve never designed an original piece in my life. Everything I’ve ever built has been a version of someone else’s work. If there was an extent to my design work it’susually just altering the dimensions to fit the need, and perhaps tweaking some embellishments or edge profiles. I’m not ashamed to admit this and I don’t think anyone else should be either. So now that I’ve admitted this openly let’s talk a little bit more about my own “design” process. It’s pretty simple, either someone comes to me with a picture of what they want built, or we identify what needs to be built and then search for examples of it through catalogs and online. It couldn’t be easier! But don’t let that fool you, because while a picture can say a thousand words, I’ve found that just about 90 to 95% of those words have nothing to do with the dimensions or a parts list. This to me is where the design process really begins, dimensioning and re-shaping a piece to fit it’s intended purpose and location. In the past, when it came to determining the dimensions for an “original” piece I would get bogged down in the quagmire of the Golden Rule and other design theories that I can’t pronounce or spell. I’m confident the measurements end up falling into them, but that’s a happy coincident and not on purpose. When I would allow myself to be ruled by these I would spend so much more time calculating and re-calculating the lengths and widths of components than I would actually spend milling and dimensioning them, not to mention I would end up with insane fractions that no one wants to deal with. Who in their right mind purposely wants to dimension components to any size that includes the possibility of fractions like 23/64″?! No rules of design were followed here! 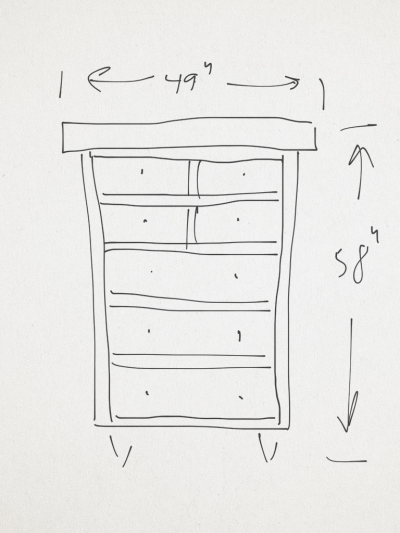 This is why my design process for large pieces of furniture is very simple. I start by asking about the location of the piece. What are the limitations on size? Do you plan to ever move it around the room? Is it being used frequently or is it more for decoration? Once I have a better idea of what I’m working with determining the dimensions is a lot easier, not easy, but easier. Usually it simply involves scaling the existing dimensions up or down by some percentage, and then tweaking it to sizes I can easily wrap my brain around. 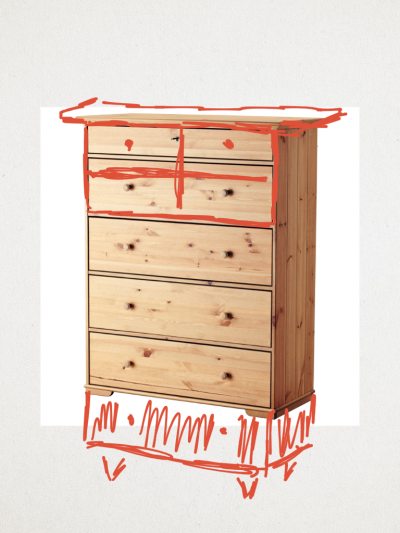 For example with the dresser I’m about to start building for my daughter the original design started as an existing piece we found somewhere and I ended up scaling it up. I don’t recall the exact starting dimensions but I’m confident I increased the height by roughly 20%. This raised it from 45″ to 54″ and it meant I had to then play with the existing drawer dimensions to accommodate the new size. 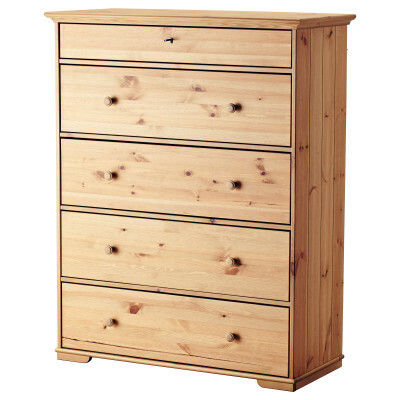 I could have either increased their height and left it at the same number of drawers or tweak them to a slightly shorter height to make room for an extra row. As for the other dimensions, width and depth. I end up asking myself if they still look proportional and pleasing to the eye or do they also need to be changed? If it turns out they need to be altered, I’ll start with the same proportional scaling and then adjust as needed. This method doesn’t always result in sizes that don’t have one of those crazy fractional dimensions I despise but if one shows up, I just round it up or down to something I want to work with and go from there. In a nutshell, I’m lazy and don’t want to work harder than I have too to determine the measurements and proportions of a project. The last thing I want to do in any project build is have to grab a magnifying glass to read my measuring tools to make sure I’m laying out a line for a crazy complex fraction that I could have avoided by scaling the project just a little bit different in the design phase. I too do much the same, that is reference a similar design. I would then adjust and adapted to my particular application. My background is tool & die design so I have experience with CAD (Computer Aided Design). This becomes somewhat easy for me making my own plans. Plus I have some artistic abilities to hand sketch my own thought. I do not see referencing others is bad. Especially if it’s for my personal use. If I was to sell the product I would think differently. My method to reference other design is to know the height, width and depth. I can fill in between. Thanks Tom! Love the information. Thank you for not being a caliper woodworker. 23/64, I wouldn’t call that lazy. As soon as the humidity changes it would be all over. You are especially welcome LOL!